We’ve partnered with Topgolf to launch our driving range to the next level with their ball flight tracking technology as seen on TV tournaments! Our 10 new bays are indoors, outdoors, and even on a second story. They all feature 6 games to play – from a points game anyone can win – to one with deep dive data for shaping your shots. Our restaurant’s full food and drink menus are available from your server while you, and up to 5 friends, hit never ending range balls. Range rats know — 1757's driving range is the place to go to work on your game. We installed state of the art SportTurf across our entire driving range in 2016, and now have partnered with Topgolf to bring you our latest innovation - 10 Toptracer bays! These are the same cameras and software they are using to show ball flight paths on TV broadcasts. They don't rely on calculations from club to ball impact like most systems, but instead track each ball as it flies through the cameras’ field of vision. The resulting actual ball flight is then rendered across multiple games, instruction tools and even virtual golf courses. The cameras’ plot every shot they can see, so duffs that don’t make it above your knees likely won’t register. Your host will help you get started with your gaming experience, but here are quick descriptions about each game to help you feel more at home. A digital rendering of our driving range. Statistics are displayed but not tracked. For the experienced golfer looking to improve. Select a club, hit a series of the same shot, and get a shot profile for that club. Make adjustments and see how your shot shapes change. Used by our team of award-winning fitters and instructors in their classes and lessons. Three shots, one hole. Get it close. Closest one wins! Each player takes six shots over two rounds to score as many points as possible. Land in the circles around targets, and watch for special multipliers, point steals, and other features on the screen. The bonus and mystery items are in the air. One to four players can select form a list of courses, formats, tees, and mulligans. Shots tracked by the cameras are rendered into the course. Three shots, one long fairway. Furthest one wins! 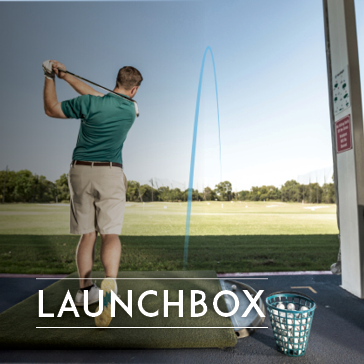 Purchase the perfect Launchbox Package for your group here then fill out this form to reserve your bay, or call 703.444.0901. Introducing Pebble Beach... Play all 18 on Launchbox! We've long been known for our excellent food under the direction of our Executive Chef Rob Fleming, and he has worked to customize a menu specifically for Launchbox centered around creative takes on easy to share and eat dishes. 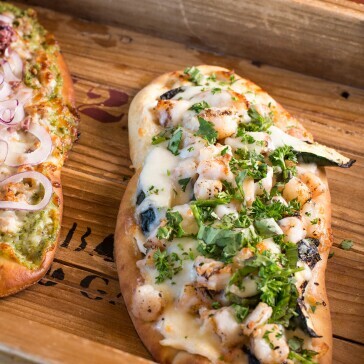 We've paired the menu with a rotating cast of local craft beers, an extensive wine list, as well as a full cocktail program to select from. Click below to explore the menu!